Watford climbed up to second in the Championship as Matej Vydra's second-half penalty secured a 1-0 win at struggling Blackpool. The Czech striker converted from the spot on 68 minutes after Tony McMahon had brought down Watford's Lloyd Dyer. The Seasiders where also awarded a penalty late on but Nile Ranger's right-footed effort struck the post. Watford, who were without boss Oscar Garcia after he suffered minor chest pains, then held on for a deserved win. The Hornets, who headed into the match off the back of a 1-0 defeat at Charlton at the weekend, are now one point behind leaders Norwich and one point ahead of third-placed Nottingham Forest, who play Fulham on Wednesday. They dominated the first half at Bloomfield Road and only goalkeeper Joe Lewis's heroics saved the home side from an embarrassing deficit. Blackpool manager Jose Riga headed into the match still looking for his first win of the season - and with a vote of confidence from chairman Karl Oyston - but his side improved after the break. Five minutes into the second half, Ishmael Miller headed on McMahon's long ball to put strike partner Francois Zoko through, but onrushing goalkeeper Heurelho Gomes made the save. Watford, who enjoyed 52% possession, made the breakthrough in the 68th minute as substitute Dyer, who had replaced Lewis McGugan eight minutes earlier, turned McMahon in the box and was brought down by the Blackpool skipper. Vydra converted the resulting penalty low to Lewis's right. Blackpool went close four minutes later when Miller's headed effort was chested down by Troy Deeney and then hooked off the line. And Watford were lucky to hold on to their lead when Daniel Pudil was adjudged to have brought down substitute Ranger, but the former Newcastle United man's penalty struck the inside of the post before rebounding clear. "We had the same opportunity that Watford took advantage of and we missed this opportunity. "The players deserve more for the commitment and the belief. My team were very good but it's always the same story - we are consistent in the game, even in the opening minutes when we gave away the ball every time. "When I analyse our games we have the same opportunities, sometimes more, but we lack efficiency. "We need a decisive player. I know that as a team to be effective you have to make the right choices." "This victory is very good news, of course but we have to improve on certain things. We have to analyse them and find solutions. "In the last game we started with three-five-two but after 20 minutes we changed and we decided to take a similar style for this game. "At the moment we don't want to have a lot of change. This is a difficult week because we have three matches and we want to work step-by-step. "It is important for Matej that he plays like a second striker to score goals. It is very important for his confidence, but the first step is to work for the team and after that the goals will come." Match ends, Blackpool 0, Watford 1. Second Half ends, Blackpool 0, Watford 1. Attempt missed. Tony McMahon (Blackpool) right footed shot from the centre of the box is close, but misses to the right. Assisted by Sergei Zenjov with a cross following a corner. Corner, Blackpool. Conceded by Gabriele Angella. Delay in match Troy Deeney (Watford) because of an injury. Attempt saved. Ishmael Miller (Blackpool) header from the centre of the box is saved in the bottom left corner. Assisted by Tony McMahon. Peter Clarke (Blackpool) wins a free kick in the attacking half. David Perkins (Blackpool) wins a free kick on the left wing. Attempt missed. Sergei Zenjov (Blackpool) header from the centre of the box is close, but misses to the right following a set piece situation. David Perkins (Blackpool) wins a free kick in the attacking half. Substitution, Watford. Gabriel Tamas replaces Matej Vydra. Substitution, Blackpool. Sergei Zenjov replaces Tomasz Cywka. Corner, Watford. Conceded by Joe Lewis. Attempt saved. Lloyd Dyer (Watford) left footed shot from the left side of the box is saved in the bottom right corner. Assisted by Troy Deeney. Delay in match Daniel Pudil (Watford) because of an injury. Penalty missed! Still Blackpool 0, Watford 1. Nile Ranger (Blackpool) hits the right post with a right footed shot. Penalty Blackpool. Nile Ranger draws a foul in the penalty area. Penalty conceded by Daniel Pudil (Watford) after a foul in the penalty area. Attempt missed. Peter Clarke (Blackpool) left footed shot from very close range is close, but misses to the right. Assisted by Tony McMahon following a set piece situation. Ishmael Miller (Blackpool) wins a free kick in the attacking half. Corner, Watford. Conceded by John Lundstram. Substitution, Watford. Sean Murray replaces Almen Abdi. Substitution, Blackpool. Nile Ranger replaces Edu Oriol. Corner, Watford. Conceded by Joan Oriol. Goal! Blackpool 0, Watford 1. 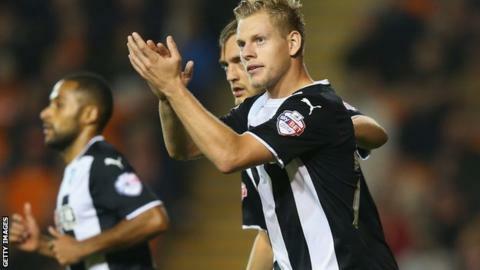 Matej Vydra (Watford) converts the penalty with a right footed shot to the bottom right corner. Penalty conceded by Tony McMahon (Blackpool) after a foul in the penalty area.